• Mini-documentary "Along the Rio Grande with Maureen O'Hara"
Artisan has been busy with certain portions of their catalog of late � especially the Westerns. 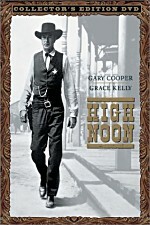 Not too long ago, the company re-released three previous titles in all new �Collector�s Edition� DVDs and they included the Gary Cooper classic, High Noon, as well as two John Wayne films, Rio Grande and The Quiet Man. The company has made some slight improvements over the previous editions and while nothing earth shattering has been done to any of the titles, it�s nice to see the studio revisit the titles to add some things that were neglected the first time around. The latter two films, Rio Grande and The Quiet Man, were both helmed by famed director John Ford and starred the onscreen duo of John Wayne and Maureen O�Hara as a divided couple dealing with the horrors of war � and the strain that families must endure during such difficult times. In this third entry to John Ford�s �Cavalry Trilogy�, John Wayne reprises his role from Fort Apache as Lieutenant Colonel Kirby York, an officer during the Civil War serving the cause of the Union. Now in the United State Cavalry and estranged from his wife Kathleen (Maureen O�Hara) and their son Jeff () since the start of the War, we find him stationed at the Rio Grande with orders to eliminate the remaining Apache�s and claim the land for the United States government. York gets some bad news one day as he learns that his son has flunked out of the West Point military academy. Being a career soldier himself, York takes the news hard, but he has no idea what�s in store for him next. The next day, as the new recruits are being brought in, Lt. Col. York finds that his son, after failing to graduate from West Point, decided to enlist and he unexpectedly finds himself under his father�s command. Lt. Col. York is visibly shaken by the sight of his son and in order to lay down some ground rules, meets with him one-on-one to make sure he knows not to expect preferential treatment from his commander, who also happens to be his father. Jeff lets it be known that he expects nothing less and demands to be treated as just another solider. With a clear understanding between the father and son/soldier and commander, life in the camp can go on as usual. However, the unexpected reunion with his son is only the beginning, as the very next day, York�s wife, Kathleen, shows up on base in order to demand the release of her son from military service. When she arrives at camp, there�s quite a bit of tension between she and her husband, as they haven�t seen each other for years and there are still some old wounds that haven�t healed from 15 years earlier when as a Union soldier, York gave the orders to burn down Kathleen�s plantation in the South. However, her mission at hand is not to pick at old wounds, as she�s come prepared to pay $100 in �Yankee gold� for the release of Jeff from duty. There are a couple of formalities however; #1, that the commander, who happens to be Lt. Col. York himself, agrees to sign the release and #2, that the solider himself sign it. Kathleen soon finds out that neither her husband, nor her son Jeff want the same thing she wants and now, the family members must deal with the harsh realities of military life during war time and the excess tension it puts upon their already strained relationship. However, as the battles become more and more intense and lamenting the fact that her husband and son have chosen this deadly lifestyle out of a sense of duty and obligation, Kathleen finds herself torn between her hatred for war and her love for her family. As the film winds down (and without giving too much away for those who haven�t seen it), Kathleen eventually finds a way to reconcile the feelings inside of her and mend her relationship with her husband, as well as come to terms with the fact that her son wants to follow in his father�s footsteps. Rio Grande looks epic in scope and contains more than its fair share of action and intensity. The battle scenes are quite impressive and it�s easy to forget that this film was made back during a time where many of the falls, tumbles, and plunges were usually done by the actors themselves and when you look at some of the equestrian work done by Ben Johnson and Harry Carey Jr. (especially the �Roman Riding� sequence), you will be truly amazed, as you realize that these were the same men reciting lines mere moments earlier � not stunt or CGI doubles. Don�t be fooled however. The film is not a balls-out Western that uses a little dialogue here and there to break up powerful battles and gunfights � in fact, it�s more of a dialogue feature that breaks up storylines with the occasional skirmish. However, there�s plenty of witty dialogue, humor, romance, and yes, even action, to be found in the feature and Rio Grande covers all the bases in order to appeal to a wide range of tastes. The film literally contains something for everyone. Rio Grande is grand indeed and comes highly recommended for fans of the Western genre and for fans of any of the principals. 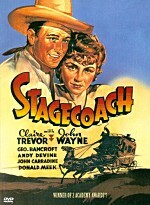 Anyone who considers themselves a John Wayne fan that doesn�t have this film on DVD can turn their card in at the door. Artisan presents Rio Grande in its original aspect ratio of 1.33:1 in a recently remastered and restored version for DVD viewers. Considering that the print is 50+ years old, this new version from Artisan looks quite nice and does an excellent job of providing a pleasant image throughout for the home viewer. The image looks great, but lacks the intricate detail that we�ve become accustomed to from more recent offerings. However, what we do have looks fairly pleasing for the most part and it is interrupted in spots by some fairly intense grain, print flakes and flecks, and on occasion, small scratches. Even so, the majority of the film is free from such anomalies and looks rather pleasing. The film was shot in black-and-white and therefore the hues portrayed are simply differing shades of black, white, and gray. Everything seemed properly balanced and contrasted for the most part, with acceptable shadow detail and delineation, with my biggest complaint being that the transfer tended to err on the side of being too dark rather than too light. While the presentation for Rio Grande doesn�t hold a candle to more recent blockbusters, the film maintains a very crisp and detailed look. Artisan has added a new soundtrack option over the original monaural soundtrack � we now have an �enhanced� soundtrack that offers up what amounts to a Dolby Digital 3.0 presentation. Given the limitations of the source material, you should know not to anticipate too much from the �enhanced� track, as most remasters from monaural sources rarely live up to expectations and many times, sound worse than the original. Thankfully, this is one of those rare occasions where the remaster actually sounds better than the original. The �enhanced� track brings a little more to the table than expected, but it�s definitely not anything that�s gonna blow you away. Surprisingly, Artisan�s �enhanced� mix is a much better way to view Rio Grande, as it�s Dolby Digital 3.0 mix made the proceedings a bit easier on the ears. While effects (gunfire, horse�s galloping) are fairly abundant, they tend to sound rather thin no matter what track you�re listening to � and the same can be said for the music. However, that�s the case with most films this old and I really didn�t pay it much thought. The best we can hope for � and what Artisan delivers � is that the dialogue is always front, center, and easily understood. There are a couple of occasions where things get a little harsh and distorted, but it quickly passes and it never interferes too greatly with the film itself. Artisan�s audio transfer for Rio Grande was nothing to write home about, but seeing as how the studio was limited by the original source material, all is forgiven. The film sounds just fine on its latest DVD incarnation and fans of the film have nothing to complain about, as Rio Grande has never sounded better. Oddly enough, Artisan has not included an optional language track or subtitles in any form. Artisan�s Rio Grande: Collector�s Edition contains quite a few nice supplements for us to work our way through with the first being found under the �AUDIO- portion of the DVD setup menu. Here we�ll find a Commentary with Maureen O�Hara and she provides us with some marvelous behind-the-scenes information. O�Hara doesn�t waste any time with formalities and jumps right in to recollecting multiple stories from the film. She covers a wide array of subjects which include the hoops jumped through in order to get the film made, anecdotes and historical information about the location shoot, endearing stories about her co-stars, as well as general recollections about the film and goings-on at the time. The stories are too random and in-depth to cover here, but rest assured that if there�s anything you would like to know about Rio Grande, O�Hara more than likely covers it � or at least briefly mentions it � here. She does a marvelous job on the solo commentary and offers up priceless information that would be all but lost had she not devoted her time to recording this informative and totally engaging piece. Listening to the commentary reminded me of sitting down with an old friend over a cup of coffee and ultimately, this was an incredible listen. Very well done and Artisan deserves major kudos for putting it all together. Stating things off under �SPECIAL FEATURES- menu are some Trailers for the DVD trilogy of films that have be re-released from Artisan. Included are �Rio Grande Collector�s Edition�, �High Noon Collector�s Edition�, and �The Quiet Man Collector�s Edition�. Next up is the marvelous documentary, The Making of Rio Grande (21:12) and it�s hosted by film critic Leonard Maltin. Here, he covers all the various aspects and details about this marvelous work and gives us some wonderful insight and backstory on what was going on with the cast, crew, and principals during the time. Maltin discusses John Ford�s �Cavalry Trilogy� which began with Fort Apache, continued on with She Wore A Yellow Ribbon, and ended with Rio Grande. We learn that the film was made with a deal attached � that after Rio Grande was made, Republic Pictures would agree to finance Ford�s pet project, The Quiet Man. The dynamics between the two stars is discussed, as is shooting on location and with the temperamental Ford, as are the themes that Ford was trying to portray in the film. This documentary covers a ton of information about the film and there�s no way I could do it justice by breaking it down into smaller portions � just know that those interviewed for the supplement provide some great information about the behind-the-scenes happenings during Rio Grande. 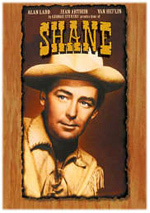 Interviews are conducted with Michael Wayne (John Wayne�s son), Harry Carey Jr. (a member of John Ford�s stock acting company and Ford stuntman), and Ben Johnson (a member of John Ford�s stock acting company and Ford stuntman). Following is Along the Rio Grande Minidocumentary (18:35) and we start off listening to Maureen O�Hara, as she describes what it was like working on the film, working with John Wayne and John Ford, and what it was like shooting on location in the Utah desert. 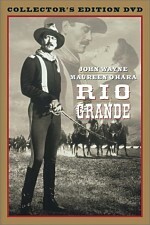 O�Hara and other discuss the relationship between she and Wayne and she offers up some invaluable insight on what it was like working on Rio Grande. Others show up to offer their comments as well and admittedly, some of it is a bit of retread from the previous extra. Even so, the two supplements compliment each other well and both are worth the small time investment it will take to check them out. Interviews in Along are conducted with Maureen O�Hara and Andrew V. McLaglen (son of John Ford stock company actor, Victor McLaglen). Artisan has added some incredible material here for film buffs and for fans of the principals involved in Rio Grande. They are to be highly commended for providing viewers with more supplemental material to peruse than on their previous outing and for taking the time to do so. Great job. Rio Grande was an enjoyable Western that succeeds in standing the test of time. While there are other Westerns out there that may be more intelligent or active, none can boast of a much better performance from the larger-than-life John Wayne. Artisan�s new �Collector�s Edition� is a great way to enjoy this classic from the comforts of you own home and the film, as well as its DVD presentation, come highly recommended.